In the battle of FNC vs. E!, Fox News wins this round. This round being cupcakes. 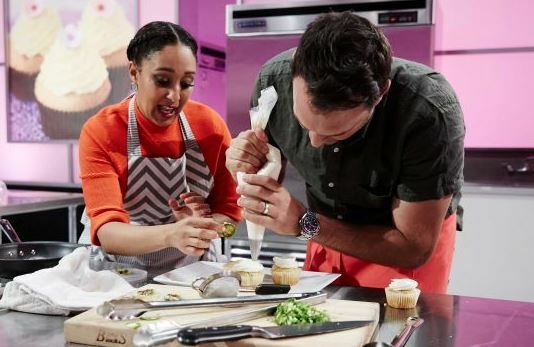 Tamera Mowry-Housley and her husband Fox News correspondent Adam Housley were crowned the winners of Celebrity Cupcake Wars on Food Network last night. Their jalapeño cornbread cupcakes beat out E! News anchor Maria Menounos‘s wasabi white chocolate cupcakes. (Do either of those sound good to you?). With their win the Housleys receive a cash donation to their charity of choice, SnowballExpress.org which helps children of fallen U.S. military members.